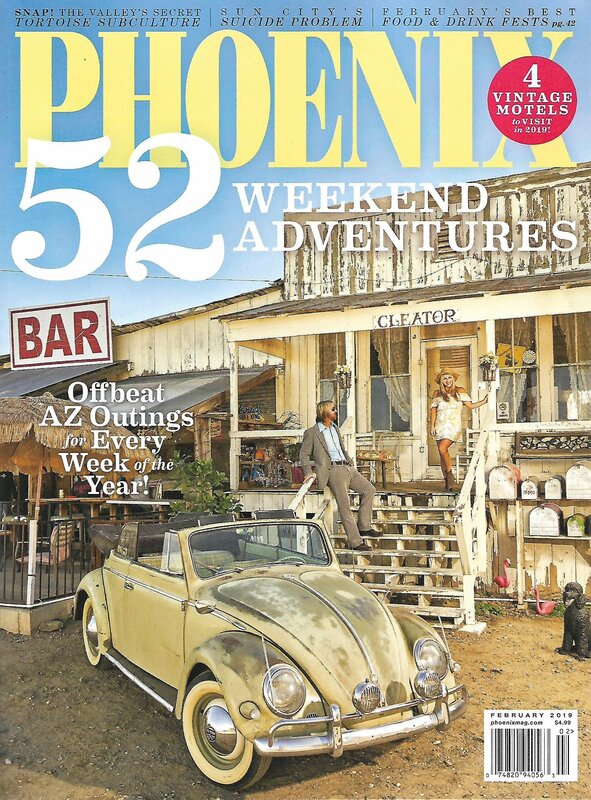 At SEEDs for Autism we are thrilled to be featured in the February edition of PHOENIX Magazine! 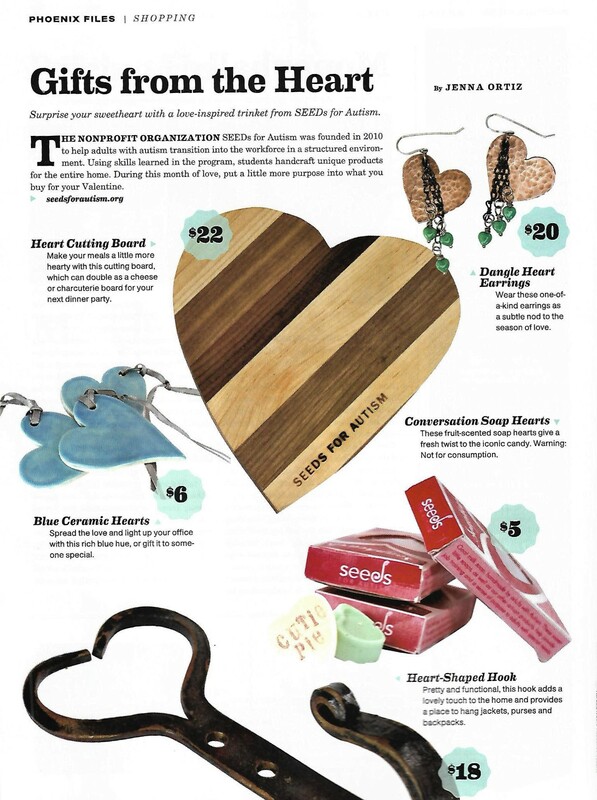 Just in time for Valentine’s Day, our wonderful selection of heart-themed products make the perfect “Gifts from the Heart” for the special people in your life! Visit our website to start shopping today! The act of sewing teaches calmness, discipline and patience. It improves hand eye coordination, inspires creativity and cultivates emotional well being. A lot of love goes into every single stitch of our hand sewn bags. The high quality work found in these colorful totes is evidence of the focus, determination and skill demonstrated by the talented and dedicated participants at SEEDs for Autism. We are happy to present these colorful items as our featured product for the month of August. Our hand sewn bags are made in the Sewing Department. Being in the Sewing Department is a lot of fun. It can be tough at times especially for me who has issues with fine motor skills. But every time that I am in the Sewing Department I learn and try to get better at it. Our current sewing instructor’s name is Tina and she joined SEEDs about a month ago. When you buy something from SEEDs not only are you getting a great product, but you are supporting our program as well. Our hand sewn bags are priced at 15 dollars a piece. I hope those that are reading this article will go out and buy our hand sewn bags. 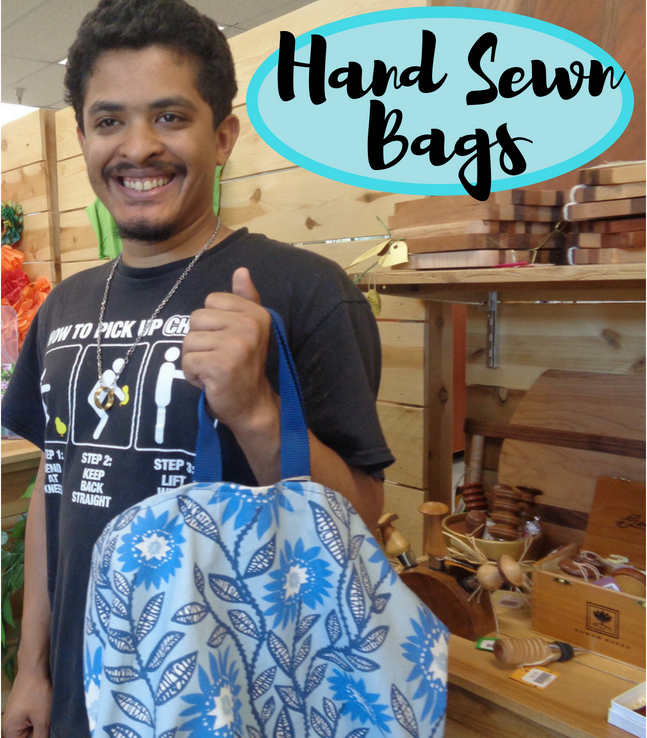 The colorful, handcrafted bags made at SEEDs make excellent reusable bags! They aren’t wasteful because the bags can be used again and again, unlike plastic bags! WHAT ARE SOME OF THE USES FOR OUR HAND SEWN BAGS? You can fill it with Groceries. You can use it as a purse or a tote bag to carry books and toys. Pack your jammies and toiletries for an overnight stay. You can carry food, drinks, a water bottle, books, video games or a small watermelon. You can purchase our hand sewn bags online at our website, on Etsy or at our location! Kyle, Jeff and Mallory share a smile during lunch break. SEEDs for Autism is a non-profit organization that provides education and vocational training for young adults on the autism spectrum. Participants learn a variety of job skills, social skills and life skills in a structured environment focused on the arts. At SEEDs, these talented individuals produce a wide variety of high quality home and garden products which are sold into the community. Truly, SEEDs is a life-changing program. I have watched shyness turn into confidence. I have seen meltdowns fade as coping skills develop. I have seen distraction evolve into focus.. I have seen these wonderful people find friends. Jordan and Camille prepare for an epic game of Scrabble during Social Day. Participants at SEEDs spend time together before morning meeting. Jesse Dean and Daniel Ch.